BMW announces new turbo engines | What Car? 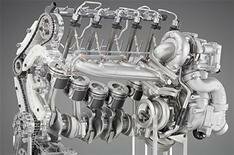 BMW has announced a new series of six-cylinder engines that are powerful enough to eventually replace its less fuel-efficient V8s. The 306bhp TwinPower Turbo 3.0-litre petrol unit has direct injection, a turbocharger and BMWs Valvetronic variable-valve timing technology. It delivers 295lb ft of pulling power from 1,200rpm and is up to 9% more fuel-efficient than the current 3.0-litre twin-turbo. It will initially be fitted in the 535i GT, where it will deliver 26.4mpg with CO2 emissions of 209g/km. The revised 3.0-litre twin-turbo diesel has received more efficient turbochargers and higher-pressure piezo-injectors; it now also delivers 306bhp, 442lb ft of pull, and fuel consumption that is improved by around 4%. It has also been announced that BMW is to fit its eight-speed automatic transmission, currently found in the 760Li and 760i saloons, to smaller models a move intended to help fuel-efficiency. BMW has just opened a new Aerodynamic Test Centre in Munich, with extensive test facilities and a new wind tunnel. It says that this will enable it to work further to improve the fuel economy, and reduce the emissions, of its vehicles.